Publicly-owned companies are now subject to several laws and regulatory mandates. The most encompassing recent law that companies must comply with is the Sarbanes-Oxley Act of 2002. Now that the first year Sarbanes-Oxley compliance has been met by large companies, they must begin the vital task of organizing for ongoing and sustainable compliance to provide strong leadership and enforcement of compliance across all regulations that impact their company. The initial compliance to the Sarbanes-Oxley Act was conducted in a project-oriented fashion with a specific deadline in mind. Since Sarbanes-Oxley compliance is an ongoing affair, organizations need to establish a capability to achieve cost-effective compliance year in and year out. This requires that companies establish a formal compliance function or office. The consensus of experts is that serious minded organizations must resort to instituting an official Compliance Office (CO) headed by a C-level Chief Compliance Officer (CCO) with responsibility for leading and enforcing enterprise-wide compliance and ethical standards to meet the major laws that apply to the enterprise. 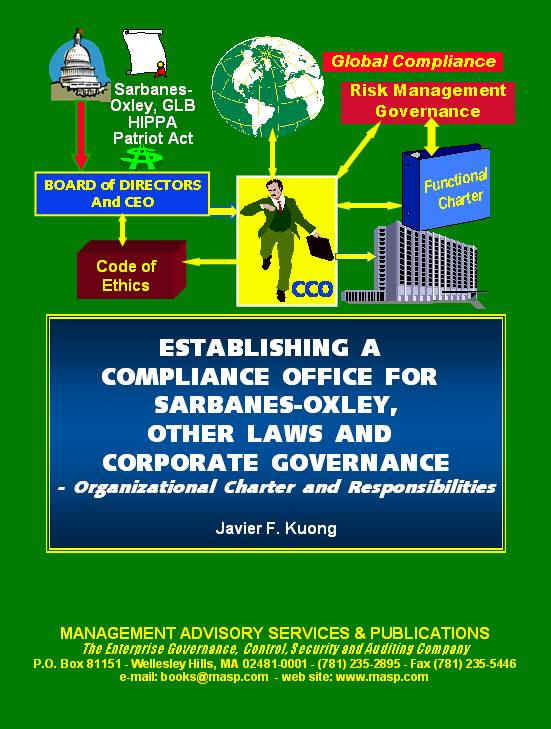 This WORKING-LEVEL practitioners publication provides CEOs, Board members, the HR and Legal divisions, and consultants with the background, strategies, approaches, and practical guidelines including a detailed functional charter and job descriptions.to develop and implement an effective Compliance Office. The book is also very valuable to auditors (internal and external), risk managers, staff and line executives, CSOs, CIOs, and all affected personnel with a clear understanding on how the Compliance Office would function, how it would impact their activities and budgets, and how to collaborate with the Chief Compliance Officer in the development and implementation of optimal compliance policies and best practices, including adherence to the company code of ethics. MAP-57 is the only book of its kind devoted to the Compliance Office. It provides in-depth information to help you plan and establish the Compliance Function for less than one hour of an experienced consultants cost! A copy of MAP-57 belongs on the desk of every executive and employee involved in compliance work. Payment of $179 per copy is enclosed (Add $8 for US and $35 for overseas airmail).A ten percent discount applies to orders of 3 or more copies.